Bobby Rush is one of those connectors to the early 20th century blues masters of the Southern Delta. He played with Elmore James and learned his craft at the feet of such bluesmen as Muddy Waters, Howlin’ Wolf, and Little Walter. He toured for decades and became known as the “King of the Chitlin Circuit.” As he aged he underwent a commercial resurrection culminating in 2007 when his album Down In Louisiana was nominated for a Grammy Award. Carl Gustafson formed his first band in 1964 and during 1993 founded Blinddog Smokin.’ Their paths continually crossed while on the road and a friendship was formed. They have finally gone into the studio together and the result is the album Decisions. What sounds like a good idea, however, doesn’t quite gel. Rush is at his best when he plays raw and basic blues. Decisions finds him trying to be a little too creative and maybe not serious enough as many of the lyrics are just too cute. “Dr. Rush” is a prime example of this problem as he raps his way through questions and answers on a pretend radio show. There are a few tracks that try to save the album. “Another Murder” features Dr. John on vocals and it is a New Orleans song to its core. The two voices play off of each other and as the lyrics explore the seedy side of the city. A judicious use of background singers and subtle brass serve to enhance the song. “Bobby Rush’s Bus” is an amusing autobiographical song. In this case it is his tour bus reminiscing, which provides a lot of room for the various band members to solo. Much of the rest of the release falls into the aforementioned average category. It may be that he is better off without a tight band behind him as it stifles his freedom of expression. The DVD consists of a music video of “Another Murder,” interviews with Rush and Dr. John, plus some behind the scenes photos. It is interesting viewing the first time through but one has to ask how many times a person will want to return to this material. 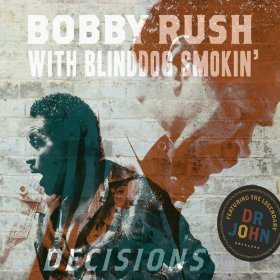 Decisions provides some glimpses of the blues genius of Bobby Rush but overall it is an album that over reaches and misses the mark. If you want to explore his blues legacy, there are better places to start. John Mayall is 80 years old and nearing the 60 year mark in a career that stretches back to 1956. His early bands contained a virtual who’s who of musicians including Eric Clapton, Peter Green, John McVie, Mick Fleetwood, and Mick Taylor. He has been a constant in the studio and on the road. He has released dozens of albums during the course of his career. His early releases found commercial success in the United States and the U.K. As time passed, he continued to be a good concert draw but his albums were less successful. Eagle Rock Entertainment has gathered three of his late career albums and issued them in a three for one package. Stories (2002), Road Dogs (2005), and In The Palace Of The King (2007) may not be among the better known albums in his huge catalogue of releases but they contain a lot of his unique brand of electric blues. Mayall has always been a consummate musician and band leader. Stories is a combination of original compositions and classic blues tunes. The Bluesbreakers line-up of guitaristBuddy Whittington, keyboardist Tom Canning, bassist Hank Van Sickle, and drummer Joe Yuele had been with him for seven years and was a tight unit. The underlying theme of the original material was a series of tributes, or stories if you will, about some blues legends. He channels Little Walter with “Southside Story,” Leadbelly on “Oh Leadbelly,” and some blues legends in “I Thought I Heard The Devil.” Complementing the theme; “Dirty Water” and “Feels Just Like Home” are fine examples of modern day electric blues. Road Dogs contains 15 original compositions written by Mayall (13) and his band (2), which is essentially the same as on his previous album. This is probably the weakest of the three releases. Mayall has written a huge number of blues tunes and while the compositions here are adequate, most are not among his better creations. The playing on such tracks as “Forty Days,” “Snake Eye,” “Beyond Control,” and “Burned Bridges” is excellent but the lyrics throw everything off a little. As average as Road Dogs may be; In The Palace Of The King is excellent throughout. It is a worthy tribute to blues legend Freddie King. The sound travels back several decades to Mayall’s classic period. “Cannonball Shuffle” is a chugging instrumental while “Palace of the King” is a blues rocker. “You’ve Got Me Licked,” “King of Kings,” and “Big Legged Woman” are all heartfelt tributes. A lot of work went into the technical side of the release and the sound is excellent. The liner notes could have been a little more complete but that is a minor complaint. John Mayall’s career has spanned three generations. 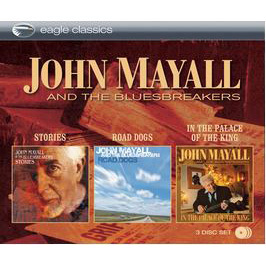 Stories + Road Dogs + In The Palace Of The King is a worthy addition to any blues collection. March 1, 1960: Farewell party for Elvis by his Army Unit. March 5, 1960: Elvis is honorably discharged from the Army at Fort Dix. March 20-21, 1960: Elvis enters the recording studio and records six songs including two future number one singles. March 1960: Advance orders for the as yet unnamed and unheard single top 1.2 million. March 26, 1960: Elvis debuts “Stuck On You” on the Frank Sinatra Timex Television Show. April 4, 1960: “Stuck On You” enters the BILLBOARD Hot 100 Chart. April 25, 1960: Stuck On You” reaches number one where it remains for four weeks. And the number one instrumental single of the rock and roll era is – drum roll please – “Theme From A Summer Place” by Percy Faith. Percy Faith was one of the originators of the easy listening sound. He took big band music and substituted strings for the brass. It was not rock and roll but he sold a lot of albums during his career. Oddly the song he is remembered for is a single. It was the theme song for the movie, A SUMMER PLACE starring Dorothy McGuire, Richard Egan, and teen heart throbs Sandra Dee and Troy Donohue. While the movie has faded into obscurity, the song remains very recognizable. “Theme From A Summer Place” was released in September of 1959 but it was not until January 11, 1960 that it finally reached the BILLBOARD Hot 100. Six week later it was number one beginning a nine week run as the number one song in the United States. It remains one of the defining songs of the pre-Beatles rock and roll era. Mark Dinning had the good fortune to be the brother of the Dinning Sisters who were a popular vocal trio during the 1940s and 1950s. Better yet his sister Jean was a songwriter and one of her compositions was “Teen Angel.” When Mark was released from the service he recorded the tune for MGM. “Teen Angel” was released as a single near the end of 1959 and on February 8, 1960, reached the top of the BILLBOARD Hot 100. Dinning would never again reach the top 50 and would pass away from a heart attack in 1986 at the age of 52. The song would make a comeback when it became a part of the AMERICAN GRAFITTI soundtrack. 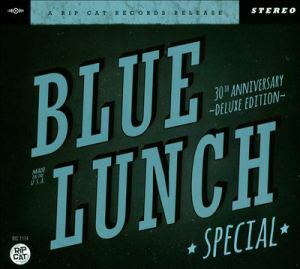 I have written several times that I have never come across a bad album on the Rip Cat label and Special: 30th Anniversary Edition by Blue Lunch keeps that streak intact. Blue Lunch is an ultimate bar band that made good. They have been plying their craft on the road and in the recording studio for close to three decades. Their newest release is a compilation of 16 tracks that celebrates the best of their career. They are a large band consisting of two saxophones, trumpet, keyboards, bass, guitars, drums and harp. There have been personal changes but vocalist/harp player Pete London, guitarist/vocalist Bob Frank, bassist Raymond Deforest, and trumpet player Mike Rubin appear on all the tracks. As with many bands that have been on the road for years they are adept at playing various types and styles of songs. The First track, “Sideswiped,” is an instrumental and is a good introduction to some of the various members of the band. It is a guitar based track with some tasty sax solos thrown in for good measure. “Cold Day Down Below” brings Mike Sands piano to the forefront with a traditional rhythm section of bass and drums in support. If there is one thing the band has learned to do, it is harmonize and they are up-front on many of the vocal tracks. “Skin Bones And Hair” has a big band feel with blasts of brass. “Cuttin’ Out” has a jazzy improvisational sound and could also be called jump blues. Blue Lunch is a band that seems to be having a good time and they invite the listener along for the ride. Their often tongue in cheek lyrics and thei aggressive style just blast out of the speakers. Special: 30th Anniversary Deluxe Edition is a good introduction to their music and will hopefully bring them some deserved mainstream success. Jonny Wickersham, (a.k.a. 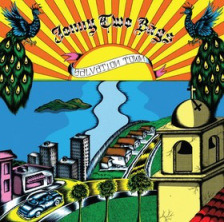 Jonny Two Bags), has released the first solo album of his career. He has been a staple on the west coast punk scene since the early 1990′s with such bands as Social Distortion, Cadillac Tramps, and the U.S. Bombs. April 1st will see the release of his Salvation Town. It is a change of direction for Wickersham. Much of his work with the three aforementioned bands had a raw and rough edge. He has now traveled in more of a mainstream rock direction. While the music is basic, there are melodies and incisive lyrics that move him away from his punk roots. Drawing on such early influences as Warren Zevon, Linda Ronstadt, and Jackson Browne; he has created a good and surprisingly cohesive album of music. The lyrics travel in a dark direction at times but they tell his stories well. Tracks such as “Ghosts,” “Wayward Cain,” “One For The Gutter,” and “Forlorn Walls” all deserve a listen of two. Now in his mid-40′s and after over two decades recording with bands, he has released a consistently excellent solo debut. He was wise enough to let the music take on a life of its own, which enabled to produce some unexpected but ultimately creative music. You are currently browsing the Muskmellon's Blog blog archives for May, 2014.